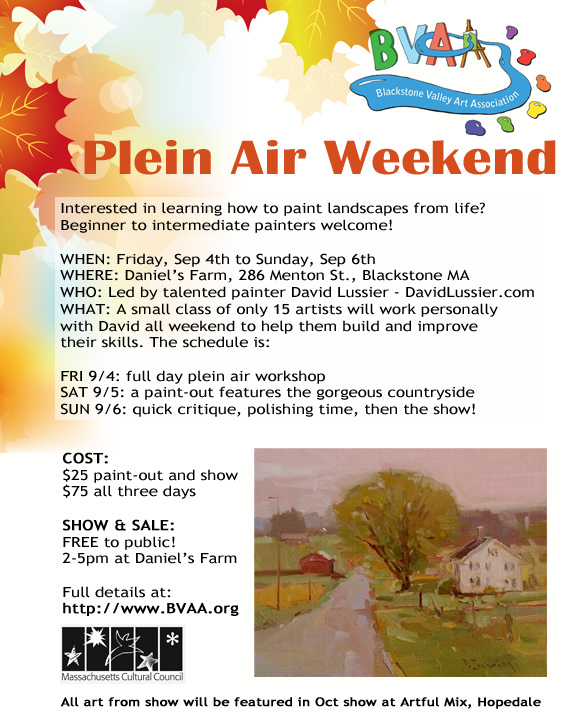 Plein Air Weekend – A Few Seats Left! We’ve got just a few seats left for our fantastic plein-air weekend at Daniel’s Farm in Blackstone! Please share the news! Fri Sep 4th – plein-air workshop lead by award winning David Lussier and his wife Pam. Sat Sep 5th – paint out featuring the Blackstone Valley area’s waterway and countryside. Sun Sep 6th – David will provide a quick critique of the works done, then a public art show!